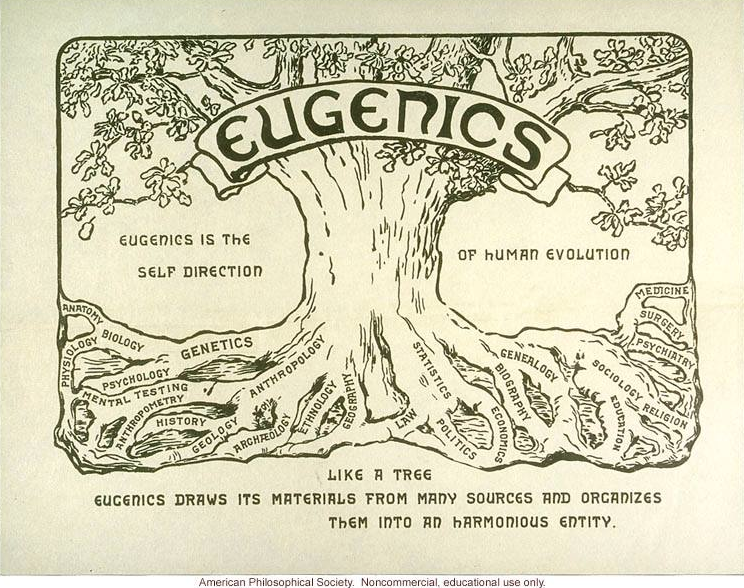 In the larger struggle against racism, we invite Judy Dow, an Abenaki educator, artist, and researcher to discuss the VT Eugenics Survey and it’s connection to the Dorthy Canfield Fisher Children’s Book Award. She will be joined by local librarians and teachers to reflect on the legacy of colonialism in our society today. 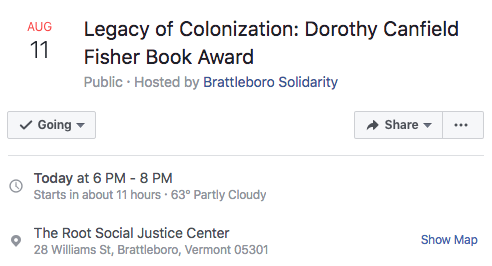 Join Brattleboro Solidarity in supporting the struggle led by Judy Dow to change the Dorothy Canfield Fisher Children’s Book Award. This last minute event is very time sensitive as the Vermont Department of Libraries will be deciding any day now whether or not to change the name. Please come to show your support. Following the talk there will be light refreshments and actions steps to be taken. Free Admission. Members of the Vermont Abenaki Artists Association serve as faculty for this one-day professional development seminar at Lake Champlain Maritime Museum (LCMM), designed to provide teachers and homeschool educators with new resources and techniques to help elementary students learn about the Abenaki tribe. This program is supported by a grant from the Vermont Humanities Council. 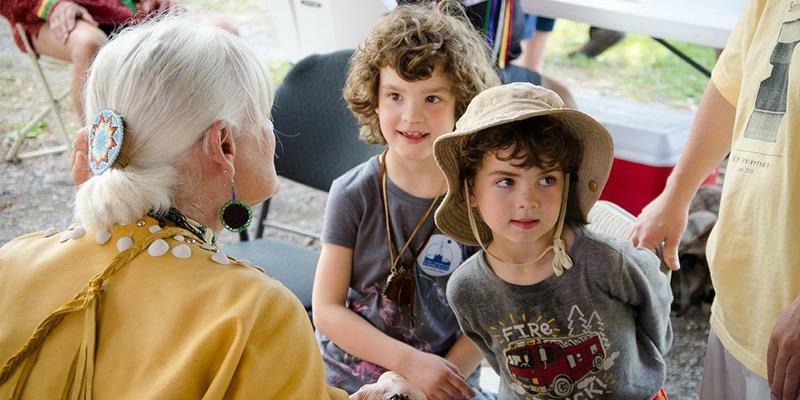 Abenaki culture and history that spans 11,000 years in the Champlain Valley will be introduced by culture bearers with a deep understanding of how this vibrant regional culture continues into the 21st century. Some of the topics include: history and stereotypes; new resources being developed for use in classrooms; age-appropriate activities; and learning how you can better support Abenaki and other Native students while presenting American history. The program includes a gallery talk and tour of the traveling exhibition Alnobak: Wearing Our Heritage that explores Abenaki identity and continuity through the lens of the clothing we make and wear to express our identity. Cost: $15 registration fee includes lunch and program materials. Melody Walker Brook is an Adjunct Professor at Champlain College and has taught The Abenakis and Their Neighbors and Abenaki Spirituality at Johnson State College. She serves on the Vermont Commission of Native American Affairs and is a traditional beadworker and finger weaver. Liz Charlebois, Abenaki culture bearer, is a powwow dancer, traditional bead worker, ash basket maker, and bitten birch bark artist. She cultivates a traditional garden and has organized a seed bank of heirloom seeds grown by the Indigenous people of the Northeast. Liz has served on the New Hampshire Commission of Native American Affairs and as Education Specialist at the Mt. Kearsarge Indian Museum in Warner, NH. Lina Longtoe is certified Project WILD instructor for the Growing Up WILD, Aquatic WILD and Project WILD K – 12 programs, which are sponsored by the EPA, US Fish and Wildlife, and the National Wildlife Federation. Her area of study is environmental science with a concentration in sustainability. She is Tribal Documentarian for the Elnu Abenaki Tribe and maintains a YouTube channel to help preserve Abenaki culture. Vera Longtoe Sheehan, Director of the Vermont Abenaki Artists Association, has a background in Museum Studies and Native American Studies. She has been designing and implementing educational programs with museums, schools and historic sites for over twenty-five years. Her art is focused on traditional clothing and twined woven plant fiber bags. The 4th Annual Pocumtuck Homelands Festival, a celebration of Native American Art, Music, and Culture, takes place on Saturday, August 5, 2017, from 10 a.m. to 7 p.m. at Unity Park Waterfront in Turners Falls, MA. The event is free, family friendly, fun, educational, accessible, and of interest to all ages. Performances include live traditional, original, and fusion music, a story teller, and three drum groups. There will be outstanding Native American artists, and games, activities and crafts for children. Also featured will be primitive skills demonstrations, a books and authors section, and condensed history lessons about Great Falls. The Mashantucket-Pequot archaeology team will be on site for the second time to analyze early contact period artifacts people bring to them. 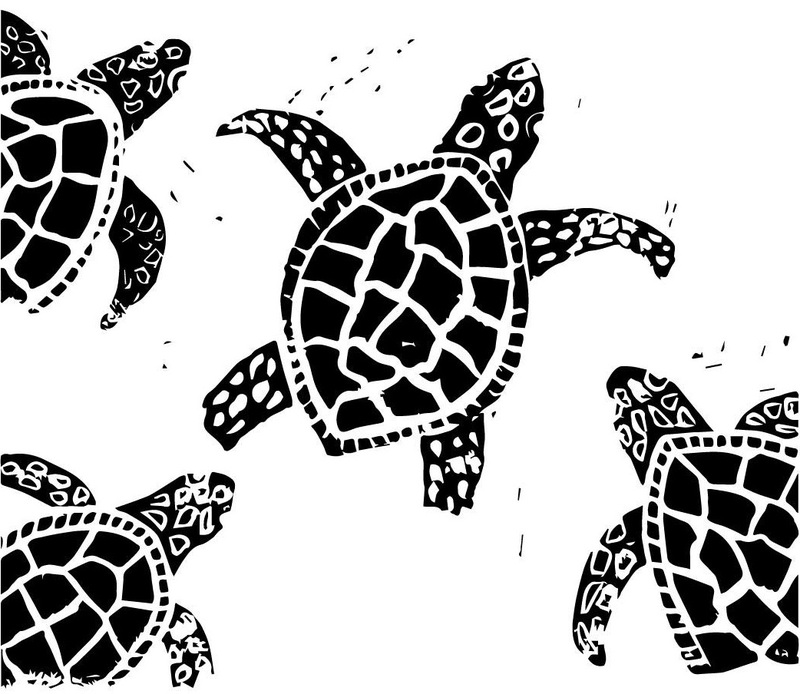 And Tim MacSweeney, keeper of the website Waking Up On Turtle Island, can help explain the significance of threatened sites considered sacred to the tribes such as in Shutesbury and Sandisfield. Food will be available, including Native American fare. Performers will be Hawk Henries, Nipmuc flute player and flute maker; the Kingfisher Singers and Dancers, Wampanoag from the Mashpee, Aquinnah, and Herring Pond communities; story teller Larry Spotted Crow Mann, Nipmuc; the Medicine Mammals Singers; and Lee Mixashawn Rozie, who uses instrumental virtuosity and stories to illuminate the indigenous and African roots of “American” music. Be energized by the presence of three drums: Chief Don Stevens and the Nulhegan-Coosuk Band of the Abenaki Singers, plus returning favorites, the Black Hawk Singers (Abenaki), and the Visioning B.E.A.R. Circle Intertribal Coalition Singers. Donations appreciated. Find more information and the schedule the week before the event at www.nolumbekaproject.org. and/or turnersfallsriverculture.org. Maine-Wabanaki REACH will present a free workshop on April 29 from 9:30-4 in Brewer. This workshop has been well received across the state, with over 600 Mainers participating. Maine and Wabanaki people are at an historical juncture in their long relationship; this workshop is an opportunity for non-Native people to reflect on our history in relation to Native people and our opportunities for the future. It includes a very brief history of US government relationships with Native people; awareness of white privilege; and an exploration of the concept of decolonization. 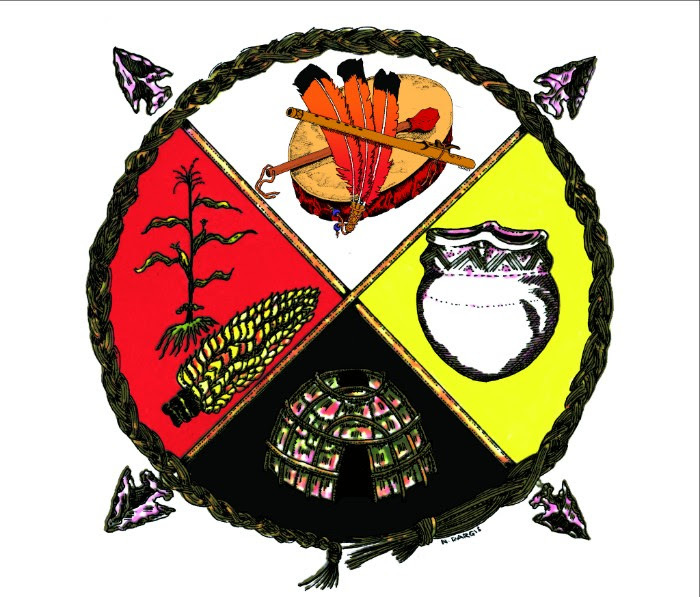 Maine-Wabanaki REACH is a cross cultural collaborative organization offering programming in Wabanaki and Maine communities. This workshop is co-sponsored by the Peace & Justice Center of Eastern Maine. Link to listing at Bangor Daily News. 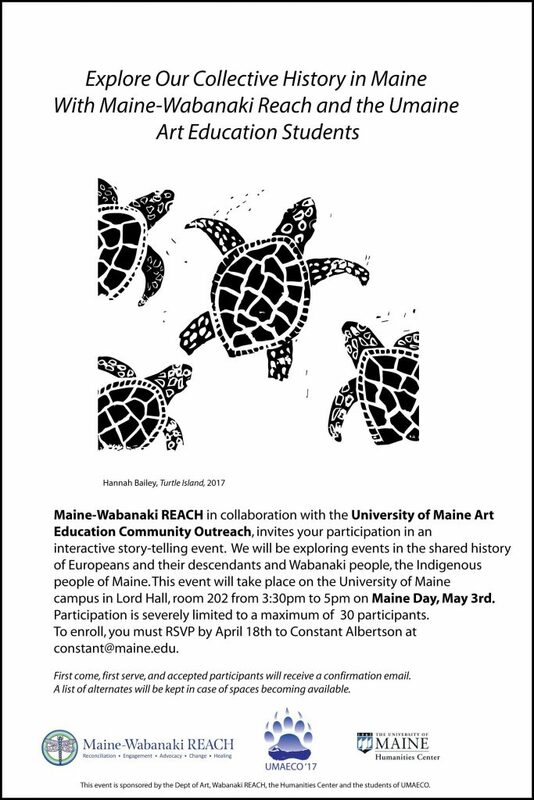 Join Maine-Wabanaki REACH and UMaine Art Education Students for an interactive story-telling event. 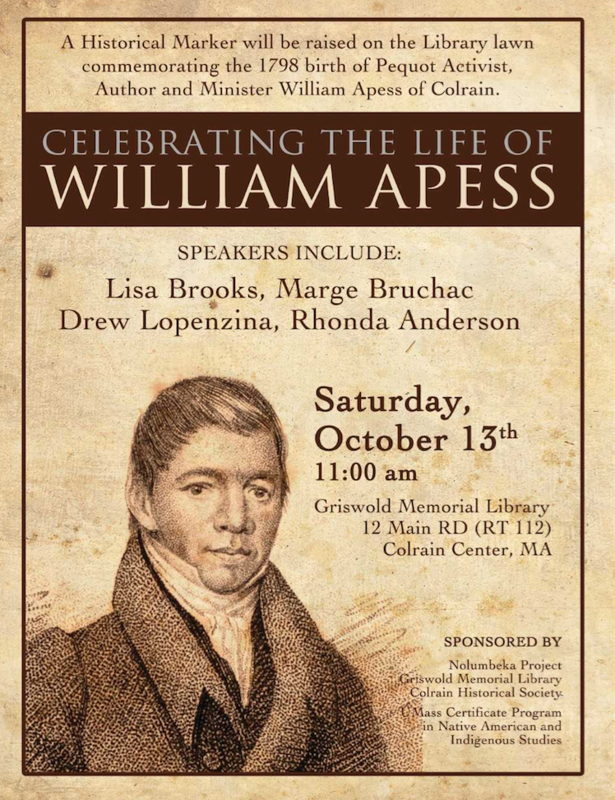 We will be exploring events in the shared history of Europeans and their descendants and Wabanaki people. Participation is limited to a maximum of 30. To enroll, you must RSVP by April 26th to Constant Albertson at constant@maine.edu. First come, first serve, and accepted participants will receive a confirmation email. A list of alternatives will be kept in case of spaces becoming available.